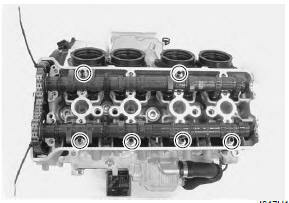 Install the dowel pins and a new cylinder head gasket (1) to the cylinder. use a new gasket to prevent gas leakage. Place the cylinder head on the gasket. when installing the cylinder head, keep the cam chain taut. Apply engine oil to the washer and thread portion of the cylinder head bolts (m10) before tightening them. Tighten the cylinder head bolts (m10) to the specified torque with a torque wrench sequentially and diagonally. Additionally tighten the cylinder head bolts with the specified angles diagonally using an angular torque gauge. 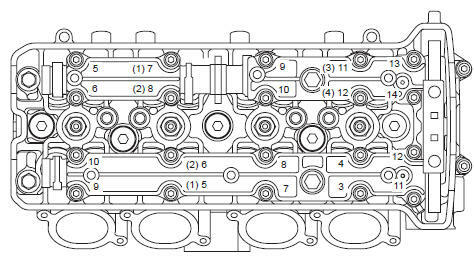 After firmly tightening the cylinder head bolts (m10), tighten the cylinder head bolts (m6) (2). Connect the water bypass hose (3). The camshafts are identified by the embossed letters. before placing the camshafts on the cylinder head, apply molybdenum oil to their journals, cam faces and holders. 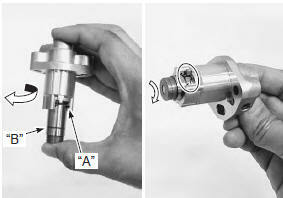 Turn the crankshaft clockwise and align the line “a” on the ckp sensor rotor to the slit “b” of cap hole thread while keeping the cam chain pulled upward. pull the cam chain upward, or the chain will be caught between crankcase and cam drive sprocket. To adjust the camshaft timing correctly, be sure to align the line “a” with slit “b” and hold this position when installing the camshafts. Pull the cam chain lightly. 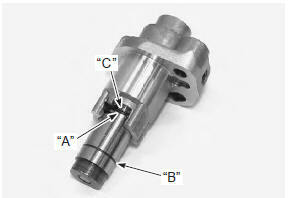 Turn the exhaust camshaft so that the arrow is aligned with the gasket surface of the cylinder head. Engage the cam chain with the exhaust camshaft sprocket. before installing the camshaft, check that the tappets are installed correctly. 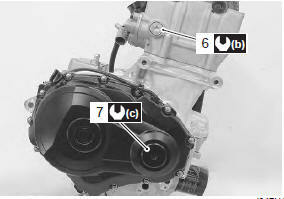 Bind the cam chain and the sprocket with a proper clamp (1) to prevent the cam chain disengagement while installing the camshaft journal holders. The other arrow marked “2” “d” should now be pointing straight up. 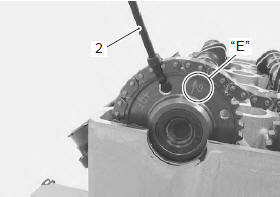 Starting from the roller pin that is directly above the arrow marked “2” “d”, count out 14 roller pins (from the exhaust camshaft side going towards the intake camshaft side). 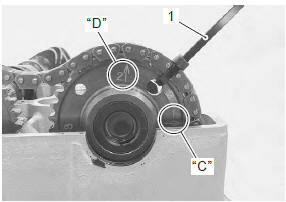 Engage the 14th roller pin “e” on the cam chain with the arrow marked “3” on the intake camshaft sprocket. 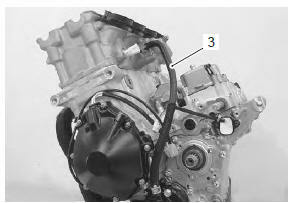 Bind the cam chain and the sprocket with a proper clamp (2) to prevent the cam chain disengagement while installing the camshaft journal holders. the cam chain should now be on all three sprockets. Be careful not to move the crankshaft until the camshaft journal holders and cam chain tension adjuster are secured. Install the camshaft journal holders and cam chain guide no. 2 (3). Have the camshaft journal holders seated evenly by tightening the camshaft journal holder bolts lightly, in the ascending order of numbers. damage to head or camshaft journal holder thrust surfaces may result if the camshaft journal holders are not drawn down evenly. 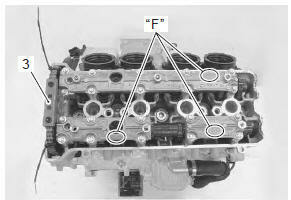 Each camshaft journal holder is identified with a cast-on letter “f”. The ascending order of numbers are indicated on the camshaft journal holders. 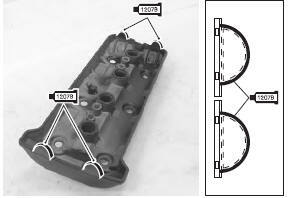 Tighten the camshaft journal holder bolts in ascending order of numbers to the specified torque. 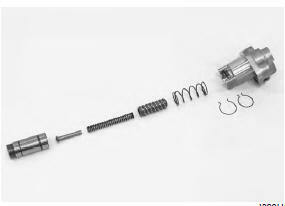 the camshaft journal holder bolts are made of a special material and much superior in strength, compared with other types of high strength bolts. Take special care not to use other types of bolts. Fit a new gasket (1). use a new gasket to prevent oil leakage. Install the cam chain tension adjuster (2). 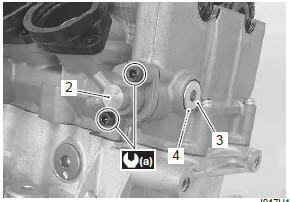 Remove the cam chain tension adjuster service cap (3) and gasket (4). Unhook the outer circlip “a” from its groove by pushing the stepped part (5) of the plunger head with a screwdriver. Rotate the crankshaft (some turns) and recheck the valve timing. make sure that the adjuster works properly by checking no slack at point “d”. the cam chain tension adjuster can be serviced with the engine installed in the frame. 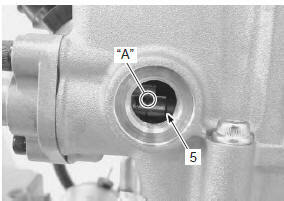 Tighten the cam chain tension adjuster service cap (6) to the specified torque. 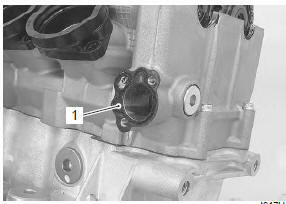 Tighten the valve timing inspection cap (7) to the specified torque. Check and adjust the valve clearance. Refer to “valve clearance inspection and adjustment” in section 0b . Pour engine oil in each oil pocket on the cylinder head. Install the dowel pins and o-rings. Install new gaskets to the cylinder head cover. 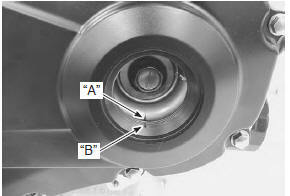 Apply bond to the cam end cap points of the gasket as shown. use new gaskets to prevent oil leakage. Place the cylinder head cover on the cylinder head. Fit a new gasket (1) to each head cover bolt. Apply engine oil to both sides of the gaskets. 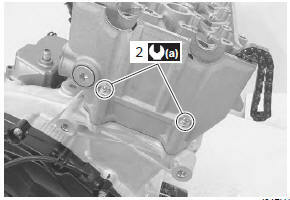 Tighten the cylinder head cover bolts to the specified torque in two steps. Install the spark plugs. Refer to “ignition coil and spark plug removal and installation” in section 1h .